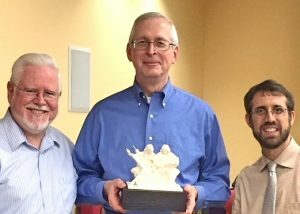 Dr. William Madges receives S&E statuette from IJCR directors. At its May 17, 2018 meeting, the Institute’s Board of Directors expressed sadness, admiration, and gratitude to Dr. William Madges as he prepares to assume the position of Chair of the Department of Theology at Xavier University in Cincinnati. The Board presented him with a miniature version of the original sculpture “Synagoga and Ecclesia in Our Time,” which he had been instrumental in realizing. Dr. Madges, who specializes in historical theology, came to SJU in 2006 to become the Dean of the College of Arts & Sciences. He left that position in 2013 to return to teaching and research in theology. 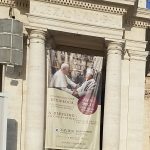 Catholic-Jewish relations is particular important to him: he was a co-creator of the traveling exhibit, A Blessing to One Another: Pope John Paul II and the Jewish People, which has been seen by more that one million people in the United States and displayed in the Vatican Museum. He has also been very committed to the mission of SJU’s Institute for Jewish-Catholic Relations. 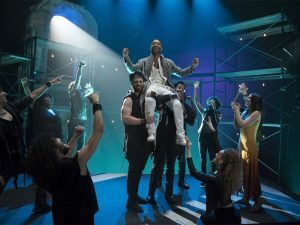 John Legend, as Jesus, is carried during a dress rehearsal scene from NBC’s “Jesus Christ Superstar Live in Concert.” Photo by Virginia Sherwood/NBC. Christian Passion plays will be performed in many venues, including an NBC live performance of “Jesus Christ Superstar” on April 1. On the same day, NBC will also air “Easter Mysteries,” an oratorio by Tony-award winner John O’Boyle that focuses on the Jewishness of Jesus and his followers. Both television productions feature an African-American actor portraying Jesus. Rabbi Skorka meets with Pope Francis at St. Joe’s on Sept. 27, 2015 (Photo by Vatican Photo Services). 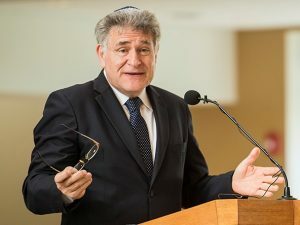 Rabbi Abraham Skorka has been appointed to the position of “University Professor,” according to a Feb. 19 announcement made by University President Mark C. Reed, Ed.D. Beginning in the fall of 2018, Skorka will work closely with the Institute for Jewish-Catholic Relations and will directly collaborate with the institute’s directors, Philip A. Cunningham, Ph.D., professor of theology and Adam Gregerman, Ph.D., assistant professor of Jewish studies, who both work in the department of theology and religious studies. On March 13, 2013, the world awaited news from the papal conclave that would reveal the identity of the next leader of the Catholic Church. To almost global surprise, Cardinal Archbishop Jorge Mario Bergoglio of Buenos Aires was named pope. As such, His Holiness claims a number of “firsts” in papal history: He is the first pope from the Americas, the first to take the name Francis, and the first member of the Society of Jesus, also known as the Jesuits, to inhabit the Holy See. As Pope Francis’s papacy reaches the five-year mark, experts from Saint Joseph’s University, one of the nation’s 28 Jesuit universities, reflect on the meaning and power of his contributions to Catholicism and the global community and what makes his ministry uniquely Jesuit. 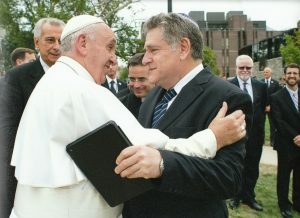 Pope Francis visited Saint Joseph’s campus during his 2015 American tour, where he was reunited with his longtime friend Rabbi Abraham Skorka. 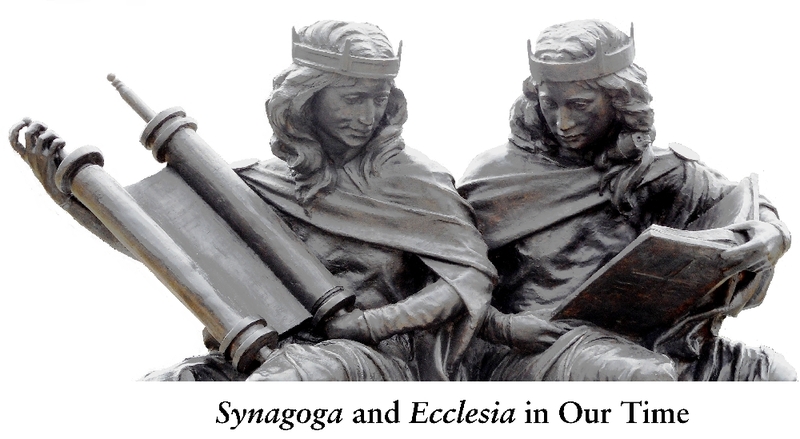 Their friendship is embodied in the University’s sculpture, Synagoga and Ecclesia in Our Time, which commemorates Nostra Aetate, the Vatican II document that transformed the relationship between the Catholic Church and other religions, most especially with Judaism. The following article appeared in the spring 2018 issue of Intellect, the magazine of SJU’s College of Arts & Sciences. The International Council of Christians and Jews (ICCJ) was receiving the same request for help, over and over again. 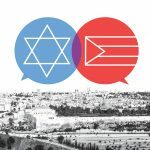 When local Jewish and Christian dialogue groups met, in countries all over the world, its members could not discuss the Israeli-Palestinian conflict without verbal battle. “The polarizing power of this topic is tremendous,” says interfaith scholar Philip A. Cunningham, Ph.D., professor of theology and director of the Institute for Jewish-Catholic Relations (IJCR) at Saint Joseph’s. 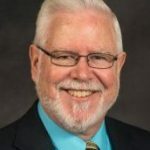 “I was hearing reports regularly that when the Israeli-Palestinian conflict came up, people were suddenly at each other’s throats.” Cunningham is the ICCJ’s most recent past president. Rabbi Abraham Skorka delivers the keynote address at the dedication of “Synagoga and Ecclesia in Our Time,” September 25, 2015. PHILADELPHIA ([date] 2018) – Saint Joseph’s University President Mark C. Reed, Ed.D., announced today the appointment of Rabbi Abraham Skorka, Ph.D., as University Professor beginning in the fall of 2018. He will work closely with the directors of the University’s Institute for Jewish-Catholic Relations to develop and expand its educational and research programs with the goal of promoting deeper understanding between Catholics and Jews. SJU hosted expert panelists in discussion of Orthodox Jews and the Catholic Church. On Thursday, Nov. 9, faculty, students, local faith leaders and community members gathered at Saint Joseph’s University for a panel discussion sponsored by the Institute for Jewish Catholic Relations (IJCR). Panelists Rabbi Mark Dratch and Rabbi Eugene Korn, Ph.D., spoke on two statements recently issued by Orthodox Jews on their relationship to the Catholic Church. Dratch and Korn were principal authors on each statement respectively. “A talk like this would be unimaginable to my grandfather,” began Korn, a scholar from Jerusalem and the academic director for the Center for Jewish-Christian Cooperation and Understanding in Israel. The Institute for Jewish-Catholic Relations of Saint Joseph’s University in Philadelphia was founded in 1967 to increase knowledge and deepen understanding between Jews and Catholics through shared study. As part of this mission, the Institute is issuing a call for papers for an academic conference entitled “Fulfilling the Promise of a New Relationship” to occur January 7-10, 2019. The conference will include both scholarly presentations of papers and roundtable discussions. The Unite the Right rally in Charlottesville was profoundly shocking and, for many, horrifying. Its resulting violence sparked marches and vigils in solidarity for victims in cities across the country. In Society Hill, it also provided an impetus for an educational opportunity. Rabbi Avi Winokur recently started a class at Society Hill Synagogue on anti-Semitism inspired by the acts in Virginia. With people marching through downtown Charlottesville, Va., in crash helmets, carrying shields and truncheons and giving Nazi salutes, there can’t be much question of the need for everybody to review the history of Christian- Jewish relations since the world learned the horrors of Auschwitz in the Second World War, says the director of the Institute for Jewish- Catholic Relations at Philadelphia’s Saint Joseph’s University. “Absolutely, it should be happening on all levels,” said Philip Cunningham, a professor of theology at the university.